With India celebrating its 70th year of independence, there is hope for a better tomorrow. Our progress in many spheres is remarkable. In the last 70 years many human development indicators have shown noteworthy improvement. For example, life expectancy has increased from 37 years in 1947 to 68.3 years in 2015. Literacy has moved from 18.3% in 1951 to 72.2% in 2015. Today, India is the fastest growing large economy in the world. But what do these achievements actually mean for citizens? This progress has not touched everyone equally — India’s economic growth is uneven and inequitable. About 300 million people live in abject poverty and are deprived of basic services such as health, education, water and sanitation. This state of deprivation leaves them vulnerable to hunger, malnutrition and disease. Infection and malnutrition in humans are generally synergistic. Studies have shown that the cycle of malnutrition-infection can cascade into a deadly trap of further nutritional deterioration and infection. Studies also indicate that simply improving nutritional intake in the presence of repeated exposure to infection was not sufficient to fully reverse the cycle and required efforts for reduction of infection. Malnutrition and tuberculosis (TB) are India’s major public health challenges. The country carries the highest TB burden in the world. 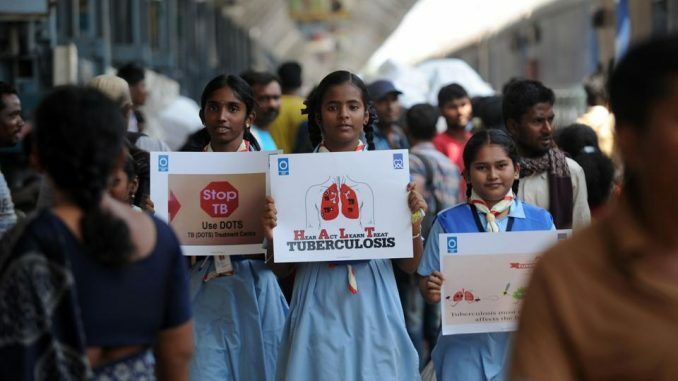 According to the WHO Global TB Report, it is estimated that there were 28 lakh new TB cases in India and 4.8 lakh people died due to the disease in 2015. People suffering from undernutrition are predisposed to contracting TB while TB can contribute to undernutrition. In India, undernutrition contributes to a staggering 55% of the annual TB incidence. Malnutrition and TB affect the poorest and most marginalised groups disproportionately. It is therefore essential that this vicious cycle of hunger and disease is broken. Our nation is in dire need of a well-regulated treatment system that offers TB patients nutritional assistance. A few states have introduced such interventions for patients. For example, from February 2016, the government of Andhra Pradesh has been distributing monthly food packets worth Rs.200 containing kidney beans, eggs, ragi powder and dal to TB patients at the tribal primary health centres (PHCs) of Visakhapatnam District. However, as most economically vulnerable patients may not have easy access to a nutrient-rich diet, we need an overarching, uniform mechanism to provide nutritional support. In order to ensure that patients consume adequate calories and nutrients, the public distribution system is one option to reach the most vulnerable. We also need to develop low-cost, fortified products and make the same available to the vulnerable population via regular markets and alternate channels like civil society organisations. The government of India is about to launch a nutrition mission that focuses its efforts on the poorest and most vulnerable populations in high-burden districts. Additionally the government has developed the National Strategic Plan (NSP) for TB Elimination to accomplish its vision to eliminate TB by 2025. It includes measures to provide nutritional support to TB patients through direct benefit transfers, nutritional assessment and counselling. This is indeed a step in the right direction. Successful implementation of this could benefit nearly nine million TB patients. One of the most gratifying features of the NSP is adequate financing for implementation. The plan proposes a budget of ₹12,327 crore for the first three years which is a four-fold increase from the previous plan’s budget. Approximately 22% of these funds have been earmarked to implement measures to link TB patients to social welfare schemes including nutritional support. We know from past experience that the best policies and intentions have not found faithful implementation on the ground. Nutritional intervention is a critical weapon in the fight against TB; its importance in the overall treatment of patients battling the disease cannot be overemphasised. While the NSP is well structured to address the barriers to TB diagnosis and treatment and to improve nutrition security of patients, its success would ultimately depend on its execution. If implemented properly, the National Strategic Plan may well sound the death-knell for TB in the country.